On December 10, 2005 the world of flyfishing lost one of the greatest contributors to the sport of flyfishing. Ernest G. Schwiebert was an angler's angler, and his efforts to enhance the sport of flyfishing by promoting the knowledge of all aspects of the sport that he loved are beyond measure. His first book, Matching the Hatch, was published in 1955 when he was in his early 20's. While the book was published during that period of time when flyfishing was nearly a forgotten sport it was to prove to be the catalyst for the revival of the renewed interest in fishing for trout with flies. The term 'matching the hatch' would become synonymous with the scientific approach to flyfishing that would become so popular in the coming years. While mostly devoted to mayflies it contained significant information on stoneflies and caddis. It is interesting that the book contains several plates with representations of natural insects but there are no drawings of the artificial fly patterns that he described in the text. The book contains hatching charts, numerous fly patterns, and a discussion of stream ethics. Looking back I find it interesting that he included a section on stream ethics at a time when there were few anglers of any type on most streams. Modern anglers might do well to go back and review Schwiebert's ideas on stream ethics. His second major book was Nymphs published in 1973. This was a very massive undertaking, and represents one of the greatest single works of its type in the history of angling entomology. It included extensive illustrations whose quality exceeded anything previously found in a book dedicated to angling entomology. While numerous books have been published since none have exceeded Schwiebert's detailed illustrations of the natural insects found in this book. Schwiebert's magnum opus was his two-volume book Trout was published in 1978. 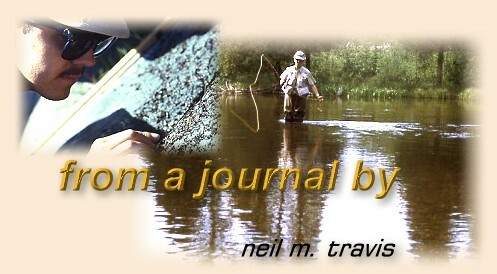 Nearly 1,800 pages and covers everything from the history of fly fishing to trout biology. It is a massive encyclopedic work and unparalleled in its scope and detail. He wrote many other books including Remembrances of Rivers Past, 1973, Death of A Riverkeeper, 1980, and A River for Christmas and other stories, 1988. He wrote other less well-known books, and co-authored books with other authors. Since his death his son has released an updated version of Nymphs in two volumes covering mayflies in one volume and caddis and stoneflies in the second volume. Ernie, as his friends called him, was a remarkable man, and I was fortunate to have made his acquaintance on several occasions over the years. Although I would never have considered myself an intimate friend I was amazed that every time that I saw him that he always remembered my name. I met him for the first time when he came to speak at the annual spring banquet of the Paul Young Chapter of Trout Unlimited in Detroit, Michigan. It was in the late 60's, and I was on the board of directors so I had the privilege of sitting at the head table where he was seated. I cannot remember his subject that evening, but I do remember talking to him after the program. The next time our paths crossed was in West Yellowstone, Montana in the early 70's when he came to speak at the Montana State Trout Unlimited Banquet. I specifically remember that he remembered my name and that we had met back in Michigan several years earlier. Amazing!